Global automatic lubrication system market expected to reach USD 1,052 million by 2025, at a CAGR of 4.5% between 2019 and 2025. The automatic lubrication system is a device used to supply lubricants in different parts of a machine during its operation. Automatic lubrication system reduces labor cost, improves machine’s efficiency, and enhances its performance. The report covers a forecast and an analysis of the automatic lubrication system market on a global and regional level. The study provides historical information for 2016, 2017, and 2018 with a forecast from 2019 to 2025 based on revenue (USD Million). The complete study covers the key drivers and restraints for the automatic lubrication system market. It also provides a market impact within the forecast period. Furthermore, the study also includes the opportunities accessible within the automatic lubrication system market on a global level. In order to offer the users of this report, a comprehensive view of the automatic lubrication system market, we have enclosed a detailed value chain analysis. To know the competitive landscape within the market, an analysis of Porter’s Five Forces model for the automatic lubrication system market has additionally been enclosed within the study. The study includes a market attractiveness analysis, wherein all the segments are benchmarked based on their market size, growth rate, and general attractiveness. 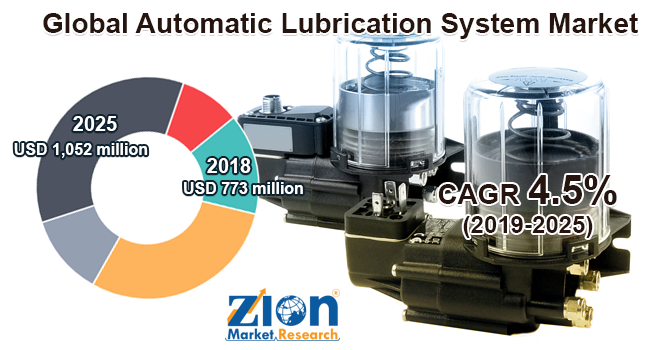 The study also includes the market share of the key participants operating in the automatic lubrication system market across the globe. Additionally, the report covered the strategic development together with acquisitions & mergers, agreements, partnerships, collaborations, and joint ventures and regional growth of key players within the market on a regional basis. The study provides a crucial view of the automatic lubrication system market based on lubrication type, component, system type, end-user industry, and region. All the segments have been analyzed based on present and future trends and the market is estimated from 2019 to 2025. Based on lubrication type, the automatic lubrication system market is classified into an oil-based and grease-based lubrication system. Based on the component, the market is segmented into the controller, pump, supply line, metering valve, and feed line. The system type segment of the market includes single-line, multi-line, dual-line, circulating oil, series progressive, and oil and air lubrication system. Based on end-user industry, the automatic lubrication system market is classified into construction, manufacturing, cement, transportation, steel, paper and printing, mining, agriculture, and power. Additionally, the regional classification includes Europe, North America, Latin America, Asia Pacific, and the Middle East and Africa. Some key players operating in the global automatic lubrication system market are Rikkon Lubes Private Limited, SKF, Groeneveld Group, KRS Multilub Pvt. Ltd., AFMC Lubrication Pvt. Ltd., Graco Inc., Cenlub Systems, S.V.A. Pricol Limited, Southern Lubrication Pvt. Ltd., Beka-Lube Products Inc., Lubrite Industries, Systematrix Engineering Service, LUBE Corporation, BEKAWORLD, and Dropco Multilub Systems Private Limited.